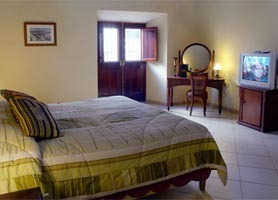 Hotel Palacio O’Farrill Old Havana is located near the picturesque Bay of Havana and Cathedral Square in Old Havana. The building is a tremendously grand neoclassical mansion standing on the corner of Cuba & Chacon Streets next to the Havana Cruise Port. Its owner, Don Ricardo O’Farrill y O’Daly, made his wealth in the slave trade, & owned several large sugar mills. Don Ricardo O’ Farrill and O’ Daly were lovers of neoclassical architecture which was in vogue at the start of the 19th Century. The hotel, Once used as a Palace offers a unique level of personal service to all guests. The historic owners originally came from County Longford, in Ireland and arrived in Havana in the early 18th Century and is known to be the originating founder of the O’ Farrill family in Cuba, a family name which is very common in Cuba even today. The Hotel Palacio O’Farrill has retained the name Palacio O’ Farrill, in honor of its original owners. If you are lucky enough to be in Cuba on the 17th of March you’ll experience the amazing Saint Patrick’s Day celebrations held at Palacio O’ Farrill. Saint Patrick is the patron saint of Ireland, and although this tradition originates in Ireland, these days it is celebrated in many countries, the United States being an example of a long tradition of celebrations and holidays. The presence of the 18th, 19th and 20th century influences represented in the Hotels architecture, décor and ambience of the Palace add to the hotel’s extraordinary presence in Old Havana. Hotel Palacio O’Farrill has an impressive entrance hall and lobby, with a toweringly high ceiling, & vast iron-studded polished mahogany master doors, elegant black marble seats in the hallway. The double-scrolled stone archway leading into the courtyard is another epic design feature. An attractive characteristic of the Palacio O’Farrill building is the way in which the mahogany detailing has remained unpainted with a slight coat of varnish to reveal the beauty of the wood. Throughout the building there are pieces of period Cuban furniture as well as several artistic reproductions, but the latter are so well produced in exact imitation of original pieces that the whole impression is one of pleasing visual synergy. 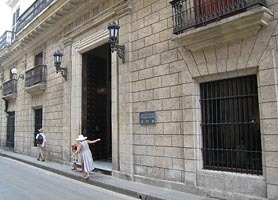 The closest Old Havana rental car Office to Hotel Palacio O’Farrill is at the Hotel Plaza. 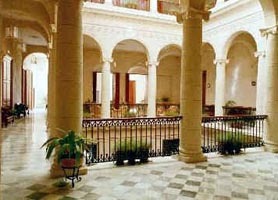 Hotel Palacio O’Farrill Old Havana is usually in very high demand and, as such, should be booked in advance. Our booking program allows reservations at Palacio O’Farril hotel without down payment or deposit which will guarantee your dates and also allows preferential modifications should your dates change in the future. 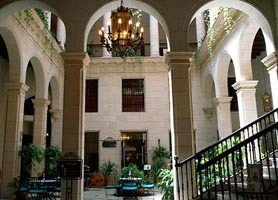 Our booking process is unique because it shows the best rate from all of these for Hotel Palacio O’Farrill in Old Havana and the types of rooms available. 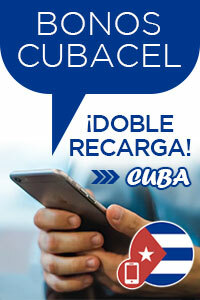 Our Hotel Palacio O’Farrill Old Havana rate comparison is an industry first for Cuban Hotels. Once you’ve compared the rates, finalizing the booking at Palacio O’Farrill Hotel takes just seconds and an immediate confirmation is provided in real-time.